Lutner - Distributions of musical instruments and accessories worldwide. Workshop "Taiga Musical Artel"-new domestic producer in our assortment! The Lutner Company engaged in sales musical instruments and accessories manufactured in Russia and beyond. We are constantly seeking distributors all over the world. Lutner SPb Ltd was founded in 1998. The company initially specialized in the wholesale trade of musical instruments and accessories, served dealers mainly in the North-West region of Russia. Gradually the company scope of activities expanded, extending its reach across the Russian Federation having dealer base ramped up. Simultaneously with enlarging dealer network the assortment of the posing products rose up. Initiated from 300 product catalog in 2000, nowadays the company can offer to its customers more than 20000 articles. Suitable geographical position of Saint Petersburg, which from its foundation was the City from where the main Russian trade routes started, allows us to set up a supply chain anywhere in the country for the short period. Now Lutner is recognized as one of the largest musical instruments distributors in Russia. The company offers a wide range of musical instruments and accessories of well-known brands from Russia and other countries of the world. The product range is always expanding: For any category customers might seek out, chances are it’s already offered in the Lutner catalog. Among our customers there are music stores, the city's musical institutions, the committees of culture, music schools, and other clients who focused on dealing with a reputed distributor. Over the years, the company earned a fine reputation. It helps us to maintain a leading position on the market of musical instruments. A steadily growing dealer network indicates reliability and serious attitude of the company employees. We value our partnership with existing clients and always welcome new dealers. Lutner SPb Ltd is a dynamically growing company, with sales averaging 15-20% annual increase. The turnover exceeds $ 12 million in 2014. The company is ranked as one of St. Petersburg’s 50 fastest-growing businesses, in accordance with the research of “Business Petersburg” newspaper. We are delighted and proud to appraise that now Lutner works with more than 700 dealers. They represent all regions of Russian Federation from Kaliningrad to Kamchatka. Our dealers present in almost every city of the country. Besides the company increased trade with the countries members of the EuroAsian Community – a trade alliance comprising Belarus, Kazakhstan and Russia. 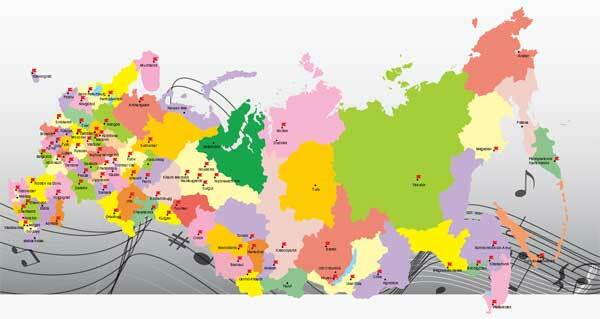 We participated on Frankfurt Music Messe in 2014 and now vigorously promote Russian-made products on world market. We deliver goods to Germany, Belgium, Spain, USA, Finland and other countries. The Lutner company collaborates with the major music chain stores. The company catalogue comprises the products of the well-known internationals brands, as well as the products manufactured under its own brand “Lutner”. The company staff is skilled and qualified by handling with different musical instruments and uniquely well versed in the nuts and bolts of dealing on this specific environment. In case of any uncertainties, we can always seek the assistance from our advisors; many of them are prominent musicians. Long-term procurement strategy allows us to maintain the stock, assuring dealers that the required products will be always available. The strategy enables to smooth over seasonal prices fluctuations, and to guarantee attractive price as a result. We are well aware of the influence music exercises on the maturing and development of a human being and society as a whole. We do our utmost that the parents, paid heed to the child’s propensity for music, will be able to assist by maintaining and bringing the glimpse up, purchasing the instruments of good quality upon affordable price, making the first step on a long way of musical education. We realize importance for the accomplished musician to develop one’s talent, and therefore, offer the broad choice of the instruments of the top quality; enable to meet one’s needs. We are flexible in pricing and utilize cutting-edge computer and information technologies. Our goal is to establish an opportunity for the musicians of any level of accomplishments in Russia can afford themselves to buy high quality musical instruments and accessories. Let the music will be affordable for everyone.